The leaves on the trees are creating beautiful views around us and inspiring our table settings. At Didriks you will find the perfect dinnerware and table accents to create an exquisite autumn setting.Pictured above are Heath Ceramics Coupe dinner plates with Match Pewter Sofia flatware set on Napoli Vintage table linen by Libeco. Stemware is by Schott Zwiesel and cutting board by J.K.Adams. Oil and vinegar set by Match Pewter and cheese knife by Berti. As the weather turns, we suggest preparing for quality time in front of the fire with Brahms Mount blankets and throws. Made in Maine, these beautiful textiles are woven using old-fashioned loom techniques and hand finished to create lasting quality. Looking for Dining and Entertaining Inspirations? Visit our blogs regularly for all kinds of exciting ideas for the home and table. Breast Cancer Awareness Month has us "thinking pink." Visit the Didriks blog and see our pink table setting of the week. The pink theme continues on our Dinner Series blog with a Pink Ribbon Fall cocktail that is both a tribute to Breast Cancer Awareness Month and delicious. Our Linens by Didriks blog offers an easy Fall table decoration idea with coordinating table linen colors by Libeco Home. At Didriks you will find an outstanding selection of outdoor furniture, tableware, linens and cookware to create your perfect living environment. Visit our store or shop online. Visit www.didriks.com or our Linens by Didriks site www.belgian-linen.com. 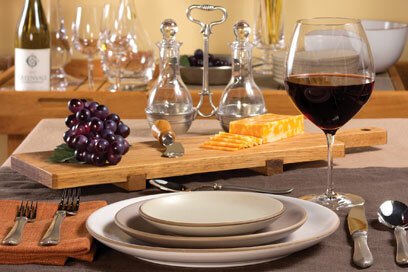 Hand crafted Italian pewter dinnerware, flatware and serving pieces add elegance to your setting. These candles are available in sophisticated scents including fresh cut gardenia and chamomile lavender. This wonderful new collection of Belgian linen is subtle and earthy in a natural flax color.